This opinion piece sums up the challenges that the murder of a journalist brought to the Slovak society as well as implications for the journalists. The purpose of the article is to show support for all independent journalists across different newsrooms in times when we have to face economic challenges and ownership pressures, as well as the spread of alternative media. 'Let’s continue talking about murder, not Fico’s media tyranny' is on the shortlist for the European Press Prize 2019 in the category 'Opinion'. Konstanty Gebert, member of the preparatory committee, commented on the piece that it is "A powerful, reasoned and yet passionate journalistic reaction to the murder of Jan Kuciak." Murder never has a positive connotation. In fact, it should not have any connotations at all. It is always brutal and everyone is a loser when face-to-face with it – it takes everything, notably all the faith in life from the victim’s family. The murderers themselves lose all their humanity. The double murder of Ján Kuciak and Martina Kušnírová hit us all like a bullet, piercing through our flesh like it did through theirs. We continue bleeding until today, receiving the same bullet over and over again. Especially when we realise this murder happened in the here and now. That it is not ‘just’ a horrific testimony from the past, from more difficult times when those people that we deemed unworthy were hanged, burned, thrown on ships for the insane or quartered. Or drowned, as if they were some unwanted kittens, unloved and written off by their families. If we attempt to forget this trauma by pushing it out of our conversations even before having thoroughly understood what happened, what it did to us as a society, what it means, what we should change so as to prevent it from ever happening again, then we will never advance. We shall forever remain in the agony of sheer and utter helplessness against evil and the abuse of power. On top of that, then Prime Minister of Slovakia, Róbert Fico, started gabbling about media tyranny and media lynching. That is the message he decided to spread. From the first days after the murder, he tried to reframe the issue. He would consciously and regularly mourn the murder of two young people – not of journalists – to emphasize the fact that this tragedy was no different from any other kind of violent tragedy. The state has the obligation to investigate the crime, but then it moves on. Fico lets tragedy be consumed by technocracy, and power by mystery. We were not ready to have to justify our disproportionate reaction to the murder of a journalist, in comparison to our silence in relation to other murders. We were not ready to compare heinous murders. Nonetheless, some would still ask us: why don’t you scream and protest as loud and as long when a grandmother is killed for twenty euros, or a child is run over on the street? It is not because a murder of an elderly lady does not concern us. Every crime – and particularly murder – troubles us. Yes, we protest, for it is cruel, and points toward a very obvious sickness in society. Ján Kuciak was murdered because of his work, and journalists represent the reader and the public at large. People turn to journalists when they cannot get the help they need from the police, or the justice they long for from the courts. The media is often the last check on power, giving voice to the many people who are otherwise mute. Thus, the murder of a journalist means someone wanted to silence not only him, but everyone, because journalists serve as the eyes and ears of the public. When someone attempts to compare such acts, they either do not comprehend the role of the media, or they purposefully reframe the issue to obfuscate or trivialise it. We are no mercenaries caught up in the middle of a political war, as Róbert Fico loves to portray us as. We undeniably make mistakes, but not even remotely close to those he has consistently been giving us credit for over the past couple of years. Slovakia boasts a community of independent journalists from a variety of media, despite corruption in boardrooms and a difficult financial reality; despite the decline of (some) readers’ appetites – albeit populists and fascists are cheerfully weaving a web of conspiracy theories; despite numerous attacks by some politicians themselves. And despite the fact that nowadays, anyone can pretend to be a journalist: secret service agents, oligarchs’ spies, provocative militants, people in dire need of medical attention, spokespeople, PR managers. There are those who honestly and diligently cross-check their facts, believe in truth and actively seek it, restlessly pose questions and tire for the reader, those who accept the immense responsibility that has been laid upon their shoulders and understand that democracy does not present itself with an alternative, those who act without ambiguity – all those deserve our support. We can see with our own eyes what is happening in countries where the ruling elite, aided by their fellow oligarchs, are hunting down journalists and eliminating independent and critical media one journal at a time. Those in power grant the right to survive only to small projects, whose reach does not go beyond the city’s borders. This way the European critics cannot object to the nonexistence of media plurality. Who owes whom an apology? 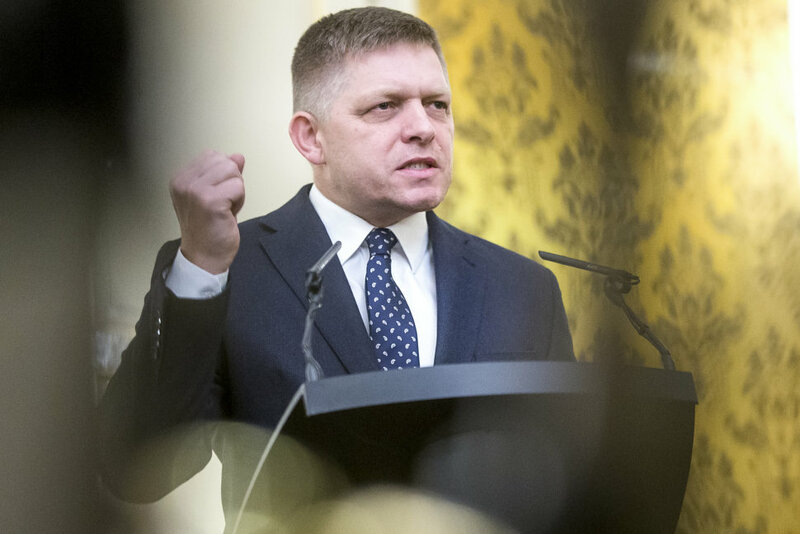 Fico is aiming for a political comeback – for himself, as well as for his comrades from government who were linked to the Italian mafia and had to resign from their positions. Who shall apologize to those people today, he demanded. It is becoming increasingly necessary to restate the facts. The ex-PM’s assistant, Mária Trošková, did business with Antonino Vadala, who was extradited from Slovakia to Italy to face criminal prosecution for drug trafficking. Secretary of the National Security Council Viliam Jasaň has close ties with the Vadala clan; Prodest, his son’s Slavomír’s security company, was co-owned by Pietro Catroppa, Antonino’s cousin. Trošková was not even obliged to undergo a security background check to move in the PM’s close proximity. Jasaň disposed of this check, but when the affair broke, he restrained the National Security Bureau from inspecting the lawfulness of the clearance acquisition. Ján Kuciak’s last unfinished work shed light precisely on these interconnections. They were sufficiently serious for Trošková and Jasaň to be forced to step down, regardless if the murder was or was not commissioned by the ‘Ndrangheta mafia. Moreover, the suspicions were so far-reaching that they forced the PM himself to resign. His downfall was not caused by George Soros, Andrej Kiska or businessmen that allegedly “bought a street”. Fico had to leave because he abused the power of his office. There is simply no rehabilitation option for him. Instead of seriously dealing with the issue of security and how to effectively provide protection for its journalists in case of jeopardy, Róbert Fico is tangling and submerging the government into his personal feud against critical media. Simultaneously, he is contesting the interpretation of the reason for his departure from office and is reaching for the renewal of his grip on absolute power in the country. Nothing more, nothing less – power is literally the only thing Fico cares about. By all means this tantrum is not a new one. Still, the dispute over the signification of “journalism” is further brought to the boil when the populists identify journalists as either “the correct ones” or “the opposition”; as friends (tamed and trained by them) or foes. Those who refuse to shut their mouths and to look the other way when they reveal corruption and other defections are classified as enemies of the state. Fico and Danko label journalists as an aggressive gang that lynches and destroys honest politicians. A squad that is never apologetic and does not care about the consequences of its actions. He prefers spokespeople, scribes of his political catchphrases, photographers to eternalize his days in the sun. Fico wants to determine whom, when, and how much to scrutinize. In their quest to re-define the notion of a journalist, Fico and Danko have opened the press code. The law should have been reopened for legitimate reasons: for example to bring it up to date with the demands of digital media. Fico already announced that in the proposed revision, he wants to mandate politicians the right to reply to the information that is published about them. If journalists work ethically and verify the information they publish, they will naturally consult the politicians implicated – that is standard practice. At the same time, if they print a mistake, it is in the journalist’s own interest to correct it. Careers are built on trust. In no way should the law dictate what and how much of a politicians’ statements the media has to publish. There is a real risk we will end up with inappropriately long declarations on the covers of magazines and webpages. Given today’s political constellation and the long-form rhetoric used by those who insist on this change, journalists are rightfully worried about the abuse of this “right” to flood the media. In a reality where Danko and Fico categorize the media as “obedient” and “defiant”, and straight-out refuse to answer the questions they are being posed, it is beyond hypocritical to demand the right to be responded to. In this environment, the mere hint of a new ‘chamber’ to issue work licenses to journalists reeks of Orbanism. Apart from that, the Council of Europe has already decided on the definition of journalism, and we can only pray the Slovak government does not have the audacity to insert their own comments into the new law. Unfortunately, the Slovak media landscape includes some outlets that have demoralized their own reporters. In exchange for allowing to do some actual journalism, management takes a fee: either a tailored article, exceptional care – or exceptional aggression – towards one or another source based on the preference of the top management. If journalists cannot be proud of the brand they are writing for, they will come up with the most colourful excuses to defend their continued allegiance to said brand. A media outlet loses a good, honest journalist forever the second they rob him of his self-respect. He will be incapable of holding up the mirror to society for his readers. All that is left will be a blurred reflection, a deviation of the truth. The journalist’s reporting will be reduced to a never-ending series of clichés and politicians’ quotes stemming from a handful of pre-approved sources. He will become a puppet of the master hidden in the shadows, transforming bullies into celebrities, con artists into businessmen, PR into news, and propaganda into truth. The murder of Ján Kuciak and Martina Kušnírová reminded many of us that journalism is not a popularity contest – a competition for the most successful PR campaign or some sort of chat show – even though we acknowledge that the pragmatic limitations to our freedom rest in our ability to provide for ourselves. Yet such limitations should never apply to our inner freedom. That kind of freedom should never even have to learn what limitations are. Except for the moral ones.